2) Lets in good stuff- In order to keep us nourished, our gut absorbs only the molecules we need (amino acids, fats, vitamins, minerals, etc.) through a 1-cell thick intestinal barrier. 3) Keeps out bad stuff- While letting in nutrients, our guts (including this intestinal barrier, our liver, and the good bacteria in our colon, amongst other players) prevent, block and/or neutralize toxins, bad critters, and chemicals that come into our body. 4) Produces nutrients- Our colons are home to as much as 4 lbs. of bacteria, many of which are beneficial to our bodies. We live in symbiosis with these good critters, giving them a home and food, while they fight off bad critters, manufacture additional nutrients (especially B-vitamins), increase the production of white blood cells, and act as antioxidants, scavenging for free radicals and cancerous cells. 5) Immunity- 60-70% of our immune system is located in our guts. 6) Acts as a 2nd Brain- Our gut actually has its own nervous system called the enteric nervous system (ENS). Did you know that our small intestines are home to as many neurons as our spinal cord? Our ENS cells also produce and house 95% of our body’s serotonin! Imbalances in this happy neurotransmitter have been implicated in a variety of mental health issues, such as depression and anxiety. Medicinal uses: Marshmallow root is an incredible herb for dealing with inflammation and irritation of the digestive tract. Its roots contain soothing mucilage, which acts as a demulcent and calms irritated tissues, as well as anti-inflammatory properties. Marshmallow can be used to treat any type of inflammation including mouth, stomach (gastritis), ulcers, and colitis, as well as diarrhea and constipation. It can also help ease heartburn. Dosage: I recommend marshmallow tea for the most immediate benefits. You can make either a hot or cold infusion (best done overnight) with the root, at a dosage of 1-2tsp/1 c water. This can be taken as often as needed. Contraindications: Due to its demulcent properties, marshmallow can slow the absorption of prescription medications and other supplements. Medicinal uses: Calendula flowers are beautiful to behold and make a lovely addition to the garden. Medicinally, calendula is a powerful anti-inflammatory and can be used externally or internally for inflammation, specifically of the skin or digestive system. Internally, taken as a tincture or tea, calendula can help with inflammation of the digestive tract and microbial infections, specifically those of a fungal nature, such as Candida yeast. Its vulnerary (wound-healing) properties can also help internally to repair the intestinal lining, for those who are recovering from gluten and other food intolerances/allergies. Calendula is also anti-spasmodic and can be used to treat gastritis, ulcers, indigestion, cramps, and diarrhea as well. Medicinal uses: The list of uses for this herb can be endless and often sound too good to be true! Chamomile is a very versatile herb. A general nervine tonic and mild sedative, chamomile can be beneficial for safely treating all types of anxiety and stress-related disorders. It relaxes and tones the entire nervous system, especially when tension and anxiety are inducing digestive symptoms, such as gas, IBS, diarrhea, acid reflux, ulcers, etc. This is due to its various other actions as an antispasmodic, carminative, anti-inflammatory, and bitter. As an antispasmodic, chamomile acts on the peripheral nerves and muscles as a sedative, indirectly relaxing the entire body, especially digestive cramping. 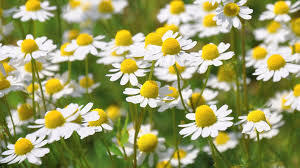 Chamomile is a mild digestive bitter, stimulating the entire digestive process and its anti-inflammatory properties have a soothing effect on the stomach and intestinal walls. Chamomile is also a vulnerary, wound-healing herb, and like Calendula can help repair damage to the intestinal lining and other digestive tissue. Medicinal Uses: Peppermint is a gentle stimulant for the nervous system. Just smelling it can give the brain and body a boost of energy and leave you feeling rejuvenated. It’s most common medicinal use is as a digestive aid. Peppermint has carminative and anti-spasmodic properties, meaning that it has an overall relaxing effect on the digestive system. It can help treat gas, indigestion, stomach cramps, and nausea, while also stimulating the secretion of bile and other digestive juices to increase the digestive process. Peppermint is also a traditional treatment for fevers, colds, and flus, helping to clear up lung and sinus congestion, break a fever, and fight infections, due to its antimicrobial properties. Dosage: For most of the above remedies, peppermint tea is the best way to ingest this herb. To make an infusion, pour 8 oz boiling water over a heaping teaspoon of dried herb and let steep, covered for at least 10 minutes. Medicinal uses: Ginger has a long history as a healing tonic in Ayurvedic medicine. Ginger has stimulating, warming, and drying actions on the body. As a digestive tonic, ginger has carminative properties, promotes bile flow from the liver, alleviates nausea and stimulates appetite. In Ayurveda, it is considered to increase overall agni or “digestive fire.” Ginger also increases circulation, making it effective for menstrual cramps, amenorrhea, alleviating coldness in the body, tension headaches and normalizing blood pressure. It is anti-inflammatory and is considered to be a detoxifying herb for the GI tract, eliminating parasites and harmful bacteria. Dosage: Both fresh and dried ginger are wonderful to incorporate into food. Ginger also makes a delicious tea, especially when fighting off an infection or settling indigestion or nausea.. An infusion can be made with the fresh or dried root, 1 tsp-1 T, steeping for 10-15 minutes. You can also brew ginger as a decoction for a stronger tea. For those with stomach irritation, it is best to avoid dried ginger. This tea is safe to drink as often as needed. Contraindications: Dried ginger is more potent than the fresh and can be irritating to the stomach in more sensitive individuals or in large quantities. It is contraindicated during pregnancy, except as a culinary spice. Dosage: Tincture: 2-4 ml/ 3x day. Infusion: 1-2 tsp dried/1 c water, infused 10-15 minutes. Drink up to 3 c a day. Dosage: Up to 3 cups/day. Tea can be brewed in larger quantities and stored in the fridge up to 3 days. Use 1-2 tsp of herbs per 8 oz cup of water. Bring herbs in water to a boil and then simmer gently for 10-12 minutes. Strain and drink 2-4 oz, 10-15 minutes before your meal or after eating to stimulate digestion.